Arrive in Eugene by plane or train, with terminals conveniently serviced by shuttles and taxis. 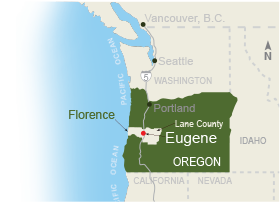 Eugene&apos;s airport (EUG) offers direct flights from Chicago - O&apos;Hare (coming June 2019), Denver, Las Vegas, Los Angeles, Oakland, Phoenix-Mesa, Portland, Salt Lake City, San Francisco, San Diego and Seattle. Eugene&apos;s Amtrak Station connects to Los Angeles with once-daily service and multiple trips north to Albany, Salem, Portland, Vancouver, WA, Seattle and Vancouver, B.C. Departing from the Amtrak Station, Porter Stage Lines offers a daily trip to Florence and The Point has a daily trip to Bend. For cyclists, Eugene&apos;s Armitage Park is the southern terminus for the 130-mile (209.21 km) Willamette Valley Scenic Bikeway. 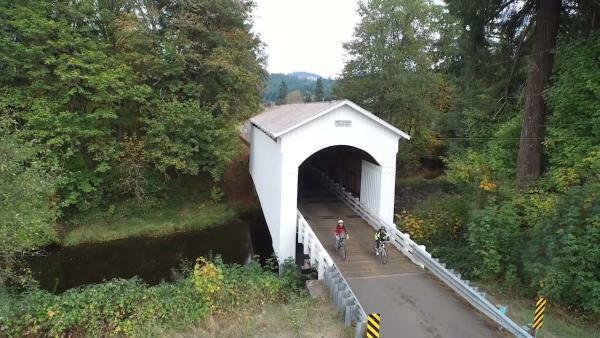 Also, ride the Covered Bridges Scenic Bikeway or the McKenzie Pass Scenic Bikeway. The TransAmerica Trail enters Lane County in the McKenzie corridor through Eugene and on to Florence or north through Coburg. Rent a bike with Rainy Peak Cycles in Cottage Grove, Bicycle Way of Life in Eugene or try PeaceHealth bike share program in downtown Eugene. Numerous paved bike paths make pedestrian and bicycle traffic convenient through Eugene - Springfield. For current road conditions go to TripCheck.com. Find winter travel tips in The Oregon Winter Driving Guide.